For many publishers, the ability to publish more books while maintaining a high standard of quality and conducting effective promotion to reach a wider audience is essential to growth. 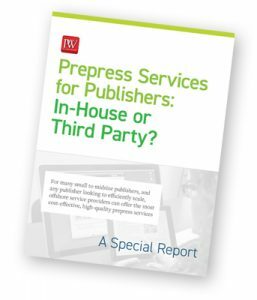 When publishers need to efficiently scale their operations, service vendors can offer cost-effective, high-quality prepress service solutions. As you grow your list, does it make sense to continue to grow an in-house staff of editors, copy editors, art directors, and production specialists? If so, will this in-house staff be able to keep up with all the books a publisher wishes to bring out in a cost-effective way? Should a publisher produce some books in-house and outsource some or all of the production tasks for other titles? In terms of speed, capacity, and cost, is it sensible to outsource much of your production work to third-party vendors, saving in-house resources for developing and maintaining author relationships, working with distributors and partners, and conducting promotion?